CHELSEA boss Antonio Conte insists Diego Costa was injured and not dropped for the Blues' 3-0 win at English Premier League champion Leicester City. It was suggested this week the Spaniard was left out of the team against the Foxes because of a lack of fitness, but after the win - which took Chelsea seven points clear at the top - Conte said Costa's absence was due to a back problem. "I think that before the game I told the truth,” the Italian told BT Sport. "I repeat the truth, because I like to tell the truth and not lie. Costa's absence mattered little for Chelsea, which responded in style after being put under pressure earlier in the day by 4-0 wins for both Tottenham, which moved to second, and Arsenal, which is now in third. 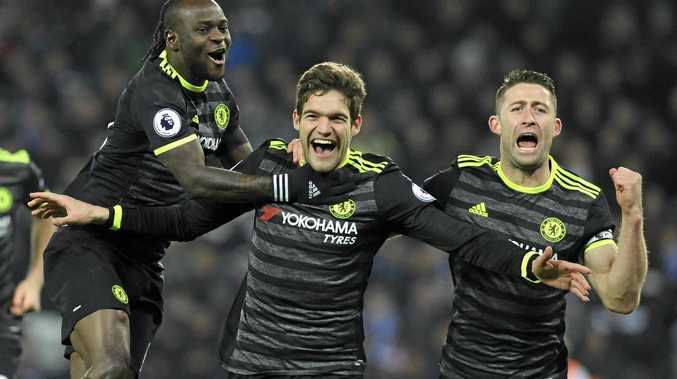 Wing back Marcos Alonso scored the Blues' first two goals at the King Power Stadium with fellow Spaniard Pedro adding a third. Spurs moved to within four points of the leaders with a sparkling display in the early kick-off against West Brom at White Hart Lane. Harry Kane became the fastest Spurs player to 60 EPL goals with a hat-trick, with a deflected Cristian Eriksen shot completing the rout. Arsenal, inspired by Alexis Sanchez, was a 4-0 winner at Swansea City, which slipped to bottom following defeat. Sanchez scored one and was involved in most of the Gunners' attacks as the visitors punished an unlucky home team that conceded two own goals and a goal to Olivier Giroud in a performance that did not deserve the scoreline. Sunderland also struggled at home, losing 3-1 to Stoke City. Hull City came from behind to beat Bournemouth 3-1, with a double from Abel Hernandez giving new manager Marco Silva the ideal league debut as it leapt from last place to now sit above Swansea and Sunderland. Joey Barton made a remarkable return for his old club Burnley, coming on as a substitute and scoring with a free-kick in the 1-0 win over Southampton. It was an emotional afternoon at Vicarage Road as Watford fans paid a lovely tribute to Graham Taylor, the former England manager who died on Thursday, before facing Middlesbrough. However, after a long round of applause for their old manager, the Hornets could not deliver the result the supporters craved as they missed chances and were held to a 0-0 draw by Middlesbrough. West Ham won 3-0 at Crystal Palace thanks in part to a spectacular Andy Carroll bicycle-kick goal.